In Rebels, we have the crew of the Ghost as our primary characters and heroes. This is not to discount Rex or Ahsoka, but the Ghost’s crew stand out as the original heroes from the first season and remain to a degree, the primary heroes of the second season, even if some have garnered more of the spotlight than others. Of that crew, only so much of their backgrounds have been explored on the show or in other media. Hera’s past was generally looked at in A New Dawn, along with Kanan, and Kanan also enjoys the currently ongoing series, Kanan: The Last Padewan (sometimes simply Kanan). 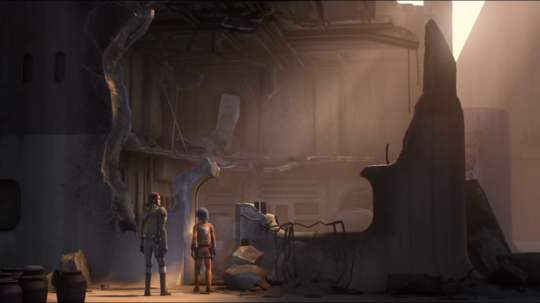 Beyond these two, we have to turn to in-show events and primarily that means Ezra and Sabine. As we write this, Sabine will be enjoying a second episode delving into her past, while Ezra as our original point-of-view character has benefited from the show turning around him and his experiences. In “Legacy,” the final episode before the mid-season break, one of the initial mysteries involving Ezra was finally resolved. That mystery was the fate of his parents, early adopters, so to speak, of rebellion against the Empire. More accurately put, they added their voices to those concerned about the wrongs of the Empire and operated a clandestine broadcasting device to get the message out there. By the time we first meet Ezra, he had been reduced to living on his own, after his parents had been snatched up for their activities. 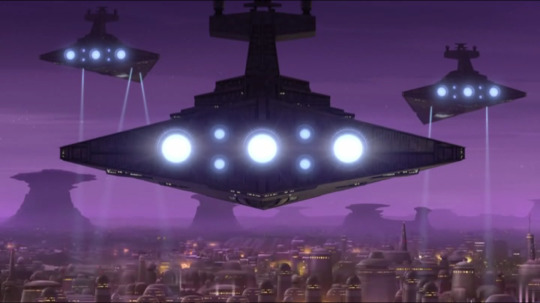 The first season had dedicated a certain amount of time to this mystery and had actually concluded with Ezra stepping into their shoes to broadcast a message of hope to the galaxy. Then, almost nothing. Season Two has been far more focused on Ezra’s training as both a Jedi and then, additionally, as a soldier. The fate of his parents, then, almost pops up by surprise in “Legacy,” with the sense that the writers had decided to go ahead and wrap up a forgotten thread and more likely, decided that it was time to cash in a chip to assist in telling Ezra’s emotional journey going forward. It begins with Ezra experiencing a Force vision in his sleep, similar to Anakin’s in Revenge of the Sith, in which he sees a glimpse of his parents in a cell and then an unidentified figure on a rock outcropping. 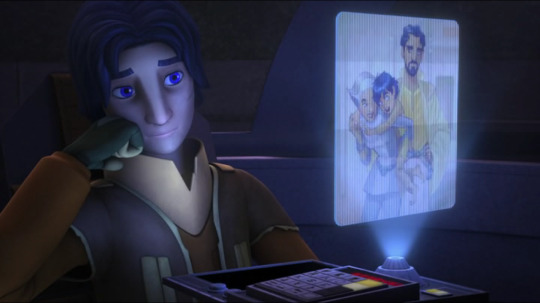 This leads him to a conversation with Hera and Kanan about his parents, where they inform him they hadn’t forgotten about them, but had nothing to tell him for all their efforts to find out their fate (Hera’s answer here smells a little like the writers explaining why we hadn’t learned anything new, ourselves.). Coincidentally, this leads to new information of a jail break and a list of escaped prisoners, none identified. This isn’t a problem, as Kanan instructs Ezra in perhaps the oddest application of the Force yet – searching a digital database. One can logically appreciate it if we replace the digital database with physical objects, but essentially, Ezra is told to let the Force guide him to the write prisoner number on a list of anonymous prisoners. It works, but before they can immediately set off for Lothal, the suspenseful ending of “The Future of the Force” is cashed in. The Empire learned at the end of that episode where the rebels were hiding and launch an assault on the planet, hoping to ensnare them. The escape is exciting both on the ground and in the air, where we see Ezra once again demonstrate his incredible growth as a Jedi with a lightsaber against storm troopers and Hera display her incredible piloting skills to dismantle a tractor beam latched onto Commander Sato’s blockade runner. One thing uncommented upon in Ezra’s fight scene is the aggression he demonstrates as he sees the Empire standing between him and his parents. Kanan appears to see it only as an exquisite display of talent, but underneath, as it seems under other similar events recently, it almost feels like something we should worry about it in terms of the Dark Side. We will probably learn more later, as Ezra will undoubtedly be tempted by the Dark Side again sometime in the future. Escape a success, Kanan, Chopper, and Ezra take the Phantom to Lothal, where Ezra discovers the Empire had burned his family home to the ground, an echo to the Empire’s attack on Luke’s farmstead. It’s a way of cutting ties for our characters, and perhaps this character arc is intended to help free Ezra from Lothal. In the ruins of the home, Ezra spots a white lothcat and ultimately tracks it to a rocky outcropping similar to that in his dream. Him and Kanan are fired upon by an unknown man who resembles the figure from his dream. The attack stops only when Ezra identifies himself, at which point, the man reveals himself to be the former governor of Lothal and close friend to Ezra’s parents. 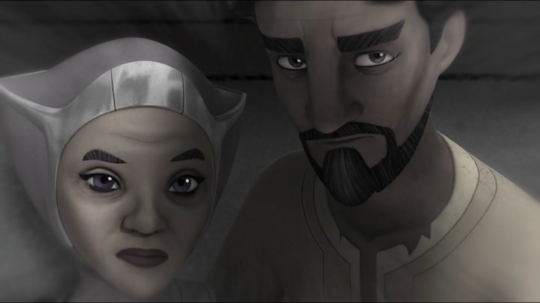 Voiced by the wonderful Clancy Brown, the former governor informs Ezra his parents died helping prisoners to escape. Ezra accepts this information stoically and we soon find him gazing at two moons setting, again a call back to Luke on Tatooine. 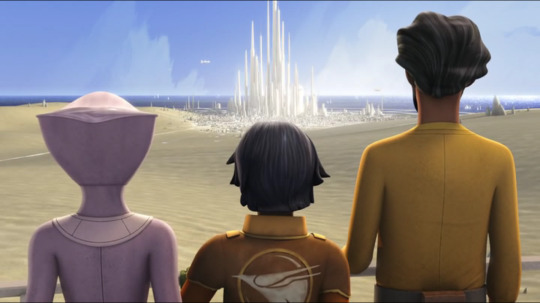 While there, he experiences a vision of himself standing on a tower with his parents, they encouraging him to continue to fight for hope, and a vision of a different, more beautiful Lothal city in the distance. Kanan appears and tells Ezra that the Force is a living energy and that when one dies, they can live on as part of the Force, inside all of us. “Legacy” wraps up one storyline concerning Ezra Bridger and does so in a satisfactory manner. We, of course, can now level the Disney orphan joke at poor Ezra, but if we are to accept the constant allusions to Luke Skywalker throughout this episode and also, previously ones, then it would seem that Ezra was destined to have those familial ties stripped away from him and replaced with a new family, one in the business of rebellion against the Empire. As always, the animation was superb, particularly the framing of certain scenes, and the scoring of the episode seemed a bit better than its usual enjoyable self. The question now remains, will Ezra’s parents legacy remain one of hope or will their death lead our character down a darker path?